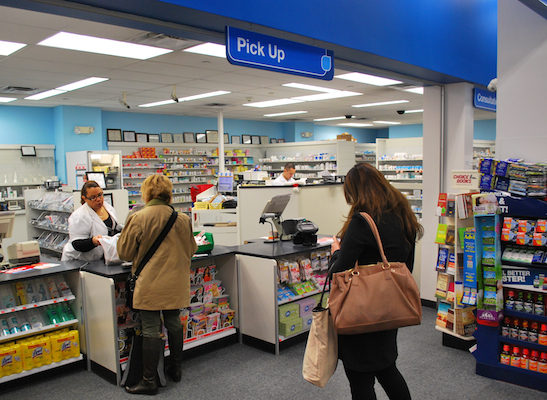 NEW YORK — Drug chains are leveraging their strengths of accessibility and convenience as they extend their core prescription drug business further into the health care realm and diversify their front-end mix. Industry observers say many of the people newly insured under the Affordable Care Act will turn to chain drug stores for their scripts and take advantage of an expanded array of over-the-counter health, beauty, wellness and consumable products and clinical services, including immunizations, medication counseling and primary medical care. “As more people gain health insurance coverage, their shopping will be based more on convenience than price. And no one is more conveniently located than that corner drug store near your house,” said Joseph Agnese, senior industry analyst at S&P Capital IQ. The health coverage expansion from the ACA should gradually lift prescription volumes over the 2014-2016 period, according to Monica Aggarwal, managing director at Fitch Ratings and head of its retail and consumer ratings group. At the same time, the nation’s improved economic outlook should support low-single-digit same-store sales growth in the front end, she said. “With the exception of expanding health care coverage leading to a onetime increase in script growth, traditional pharmaceutical demand in the U.S. is fairly saturated. Growth will be driven by new, expensive therapies prescribed only to a small percentage of the population, and reimbursement pressures will grow, too,” Aggarwal explained. “To drive growth and sustain profit margins, pharmacies are moving into more value-added and profitable businesses, such as on-site clinics, specialty pharmacy and services. We think this trend will continue. Despite facing off with a host of competitors in the pharmaceuticals market, chain drug retailers are well positioned to capitalize on the rising utilization of prescription drugs, according to drug store industry analysts. The Centers for Medicare and Medicaid Services forecasts prescription drug spending to grow more than 6% in 2015 and then average over 5% growth a year through 2019. Annual spending growth is expected to again top 6% for 2020-2023, fueled in part by the increased availability of expensive specialty drugs. Chains are also benefiting from the fact that consumers seem to prefer shopping at chains versus other formats, noted Fein, who’s also chief executive officer of Pembroke’s Drug Channels Institute. “If you look back over the last few years, chains have had a disproportionate share of the pharmacy industry’s growth, much faster than smaller independent and mail pharmacies,” she said. It has been a different story in the front end, where drug stores have labored to spur growth in the face of intense competition from traditional and nontraditional formats — dollar stores in particular, Agnese said. Yet drug chains have worked to become even more convenient and cater to individual shoppers. “We believe expansion of loyalty card programs will help support increased basket sizes and traffic, reflecting a more personal shopping experience for customers. Additionally, loyalty programs will help support retailer margins due to improved marketing and promotional spend efficiency,” Agnese wrote in a research note. 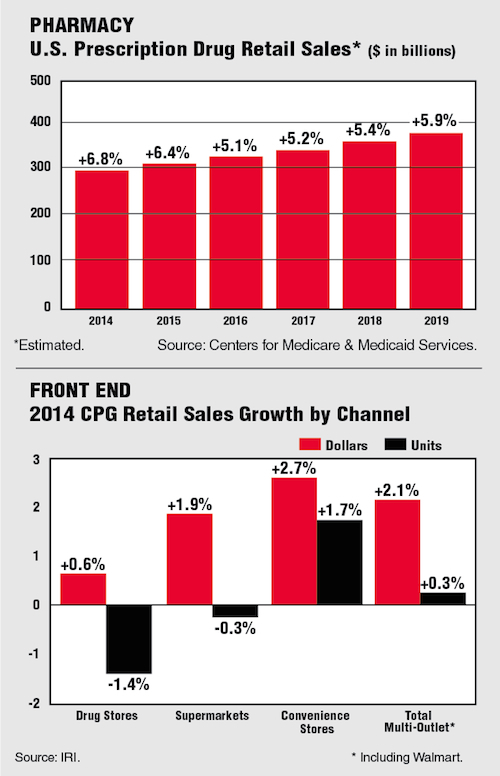 Drug chains, too, have been adept at developing new store designs that enhance the shopping experience and highlight new front-end offerings, including exclusive beauty lines, fresh food and store brands, analysts said. Industry consolidation has left no substantial acquisition targets for the national drug chains, Aggarwal noted. Though some regional chains might prove attractive targets as geographical fill-in acquisitions, in terms of prescription share they would “barely move the needle” for the big chains, said Agnese. “The market for [prescription] file buys will remain fairly active, as independents remain under significant reimbursement pressure in an already laser-thin-margin business,” Aggarwal said. “However, there is still a place for smaller chain drug stores and independents in geographies not served by the top three drug store chains. Among the large players, more cross-sector alignments and acquisitions may be in the offing, she said, citing recent deals such as Walgreens’ partnership with Alliance Boots and AmerisourceBergen, CVS Health’s generics sourcing joint venture with Cardinal Health, McKesson’s acquisition of Celesio and Rite Aid’s pending purchase of EnvisionRx. “We will see additional ways the industry attempts to combine that create efficiencies through various forms of scale over the next few years,” Aggarwal said. Going forward, the major pharmacy retailers must figure out how to tackle the booming specialty drug market, where there’s a battle for patients, according to Fein. “The chains need to be much more focused on how they’re going to participate in the dispensing of specialty drugs,” he said.